Welcome to the #INSPIRATIONSERIES of the Fashion Potluck Podcast. In the first episode, we talked to Floortje van Cooten, also known as Floortjeloves. Floortje is a successful blogger, a founder of a PR agency, and a mastermind of a jewelry brand. ○ Her entrepreneurship journey - growing 3 brands on her own and future plans. Julia [00:00:00] Hi everyone. My name is Julia and I'm the Chief Marketing Officer of FashionPotluck.com, which is a women driven social media platform. Today I have a special guest. 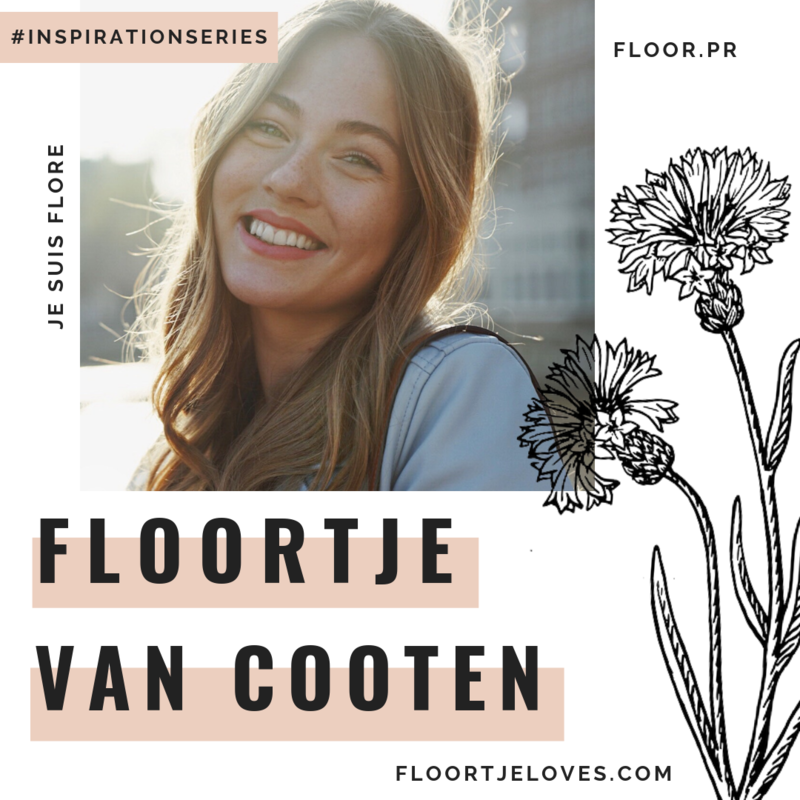 A succesful blogger, a founder of a PR agency, and a mastermind of a jewelry brand - Floortje van Cooten, or as she's know in Instagram - Floortjeloves. Hi! Floortje [00:00:19] Hi! That's so sweet! Thank you! Julia [00:00:19] At Fashion Potluck one of our goals is to inspire and empower women. Looking at your story, it is very interesting and inspiring and this is what I would love to talk to you about today. So, starting with the beginning, your childhood, in your blog you mentioned that you were bullied in school for dressing differently. How did this affect you and how did you find courage to start your own fashion blog? Floortje [00:00:45] Yeah. I was in school. It started mostly at high school when I was bullied a lot. And, you can imagine if you're a 16 year old that makes you super insecure about everything. You're scared to go to school sometime. I remember I got this super colorful dress with all kinds of colors and I felt really like a bohemian princess, was literally rocking it, but I was so happy with the dress but also so afraid to go to school because I knew they were going to say something about it, which they did obviously. But that never stopped me of wearing things I loved because it was just like me and it made me happy and it made me feel good to express myself in a way of fashion. So that's actually the reason why I started the blog because I wanted to share something. I shared the love of fashion with my mom. But yet that was just like my mom as well. And I wanted to share with friends which I didn't really have. It sounds like a sad story, but I'm a happy kid. (laughing) And so I had this computer full of beautiful street style images and collages. And I was like okay why not share it on the blog. I remember I was like following a DIY blog and I was like oh that's pretty cool I can do it myself. So that's why I started. Julia [00:02:06] How old were you when you started it? Floortje [00:02:08] 15-16. I think I just turned 16 because it was November 20th 2011. Julia [00:02:16] And Instagram and blogs were not so popular yet, right? Floortje [00:02:19] No no. That's why I basically did it in English because I felt like OK everybody here doesn't understand fashion. Well, where I come from they don't. But of course in the city it's different. But I I didn't know. So I was like Okay I will do it in English and then I will reach maybe more people, but I never thought that people would actually read it. It was more like an online diary for me. And then I started getting some comments and followers on Google Plus by the time. Now it's like whoa this is, this is cool. What is this? And I used Bloglovin and started Instagram. First I had Instagram and Facebook, that was quite fun I think. Then things started rolling and I was like Okay, learning more about the blogging world and yeah started loving it more and more. Julia [00:03:05] Awesome. And now it is your full time job, right? Julia [00:03:08] Not only blogging. We will go to the PR and jewelry brand later. It became you a full time career. Floortje [00:03:14] Yeah. Especially when I moved to Amsterdam, it was like three years ago already, I started to make more money out of it and started to make a living out of it because I was close to the fire. I could go to any event and meeting without driving one hour to the city, to see people or meet people. Julia [00:03:34] Where did you live before? Floortje [00:03:36] It's called Linden. Probably no one knows. (laughing) It's close to Nijmegen, Arnhem, in that direction. It's like a really small village. Julia [00:03:49] So you had the fashion blog, as we just confirmed. You tried yourself as a model as you mentioned in your blog as well. And you studied fashion and management in Utrecht, right? Julia [00:03:59] So have you thought about launching your own clothing line? Floortje [00:04:04] I have. I was always this kid who was doing DIY. When I saw ,I remember, I made a Chanel shirt I saw and I was like I could make that myself! So it was always like doing and making things and I still feel like I want to make something that I miss. For example, good shirts, like the good basics. I think they're hard to find for a good price. And especially now with the fashion sustainable thing going on. If I will launch something it will be something that is 100 percent sustainable or as sustainable as possible. At least fair made. So that's what I try with my jewelry already and I hope to expand it. First with bags because I love bags. And then maybe clothes one day, for now is not my main priority. Julia [00:04:56] But you are considering it? Floortje [00:04:58] Yes. If the opportunity shows up. I would love to start. Julia [00:05:02] Okay. And talking about fashion and sustainability as you mentioned now. You took part in "Genaaid". Floortje [00:05:11] Haha. Do you know what it means? Floortje [00:05:13] It has two different meanings. It's like sewing. So, sewing clothing, but also like fucked so people are like playing you. We didn't know anything and then we were there. We were like oh we're "Genaaid", we're so fucked that we did this. Floortje [00:05:32] So, that's the meaning. Julia [00:05:33] So, for the ones who are listening "Genaaid" is the Dutch TV show, where a group of five people was sent to Myanmar, and Floortje was one of them to explore and to take part in the fast fashion production. How was it? Floortje [00:05:50] It was terrible. It was the most wonderful experience ever because for me it really opened my eyes because I always have been this happy kid. We have such a good life here in Europe and then the Dutch people are often complaining and then, you come to a country where there is nothing. Where they do the dirtiest and heaviest work, you have no idea of. So, we can buy a T-shirt for 2-5 euros and to see the other side and to meet these people and see how grateful they are with nothing and how hard they work. It was so shocking. And, when I came home after two weeks living there I was a little lost as well because I felt like Okay I want to do something. I met these people. I felt them in such a short time. You're so close because you feel the stories, you see to the pain they have. You see them crying because of the things they can't do or won't do. But they can't because there are no opportunities. And then you just don't know where to begin because the market is so hard and then you see... I live in the centre. So I pass by the big fast fashion shops and then even two months after sales, the racks are still full with clothing for two euros, and I was like "wow, I made these clothes with these people". I felt how it is to make these clothing. It's so unfair that it's sold for such a low price. So for me it was like the most amazing experience. Julia [00:07:24] What did you do there exactly? How was your day to day in Myanmar? Listen to the continuation in the player above. If you have any questions, feedback, or suggestions regarding our podcasts, email us at inspire@fashionpotluck.com. *Disclaimer: The purpose of this podcast is to educate and to inform. It is no substitute for professional care by a doctor or other qualified professional. Statements made by Fashion Potluck's guests and speakers do not reflect Fashion Potluck's views, and are shared as personal opinions of interviewed individuals.